Anyone looking for a suburban-style mall has to travel to the outer edges of New York City, but there are a few sprawling commercial centers for New Yorkers who can drive to the southern reaches of Brooklyn. One of those malls is Ceasar’s Bay Shopping Center, a couple of acres of chain stores and parking lots on the shore of Gravesend Bay. Real estate investment company Surrey Equities has filed plans for a new building at the complex, which sits on the border between Gravesend and Bath Beach. The commercial structure at 1684 Shore Parkway would be a single-story, 11,500-square-foot building. It would boost the mall’s size to a whopping 312,366 square feet of commercial space. Leon Silvera, the co-founder of Surrey, told YIMBY that the new addition would have a mix of “food and service-oriented tenants.” The building hasn’t been leased up yet, but Ripco Realty is handling the marketing and leasing. 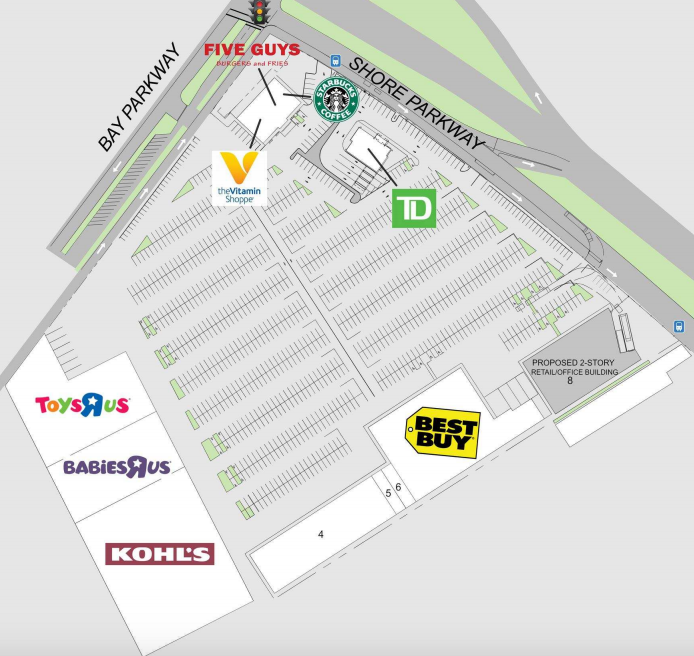 Current tenants at Ceasar’s Bay include Kohl’s, Toys R Us, Best Buy, Five Guys, Modell’s, and Starbucks. The parking lot has 1,200 spaces. 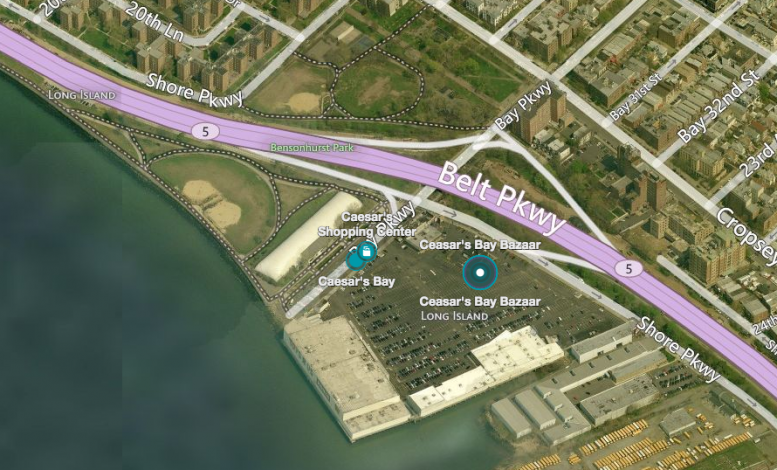 The properties next door are home to a BJ’s, New York Sports Club, a small amusement park, Bayside Fuel Oil, the Department of Sanitation, and a large marina. The mall and its big parking lot are bounded by the bay; the Belt, Shore, and Bay Parkways; and a large waterfront public park. The area is technically zoned for heavy manufacturing, but all kinds of retail development are allowed. Flatiron-based Scott Henson Architect applied for the permits. 4 Comments on "Gravesend Mall Plans an Expansion at 1684 Shore Parkway"
I remember the old E.J. Korvette department store here. Then I think there was a KMart. I always wondered why they allowed the misspelling “Ceasar” to stand; some of us in the neighborhood thought it made us look ignorant. E.J. Korvette sold a little bit of everything. They had a great record department and I still have many vinyl records I bought there in the 1970s. Ceasar’s Bay Bazaar was huge flea market where the crap of Brooklyn was sold. A lot of it probably of dubious origin. After you shop, you can go to Beefsteak Charlie’s for dinner, and stay at the LullaBUY of Broadway, the Milford Plaza Hotel.